"Part of redecorating bedrooms means sewing new bed skirts (or dust ruffles), pillows, curtains, etc. When we came out with our “Shams with Style” book, I had lots of people ask me to come out with patterns for curtains and bed skirts. To me, a bed skirt doesn’t make an interesting enough pattern to put out on the market. However, I thought I would just do a quick tutorial for those who want to learn how I make their own. I don’t particularly like making bed skirts (boring! ), but knowing how to make them means that I can make them out of the fabric of my choice. That can really help make the room! 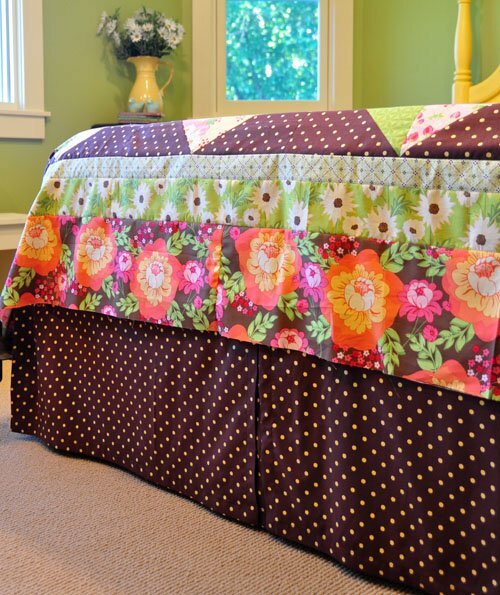 "To get started, let me just say that bed skirts are really easy to make. It only took me about 3 hours to finish the whole thing. 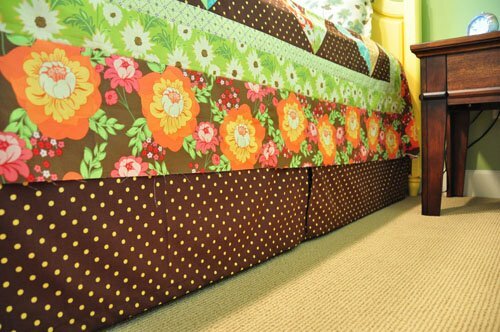 The style of bed skirt that I like is really basic, with no frills or fuss, but very skilled use (NOT) of Velcro and hot glue. This technique is one that I learned from my Mom. She used to make her bed skirts by sewing a ruffled fabric to a large rectangle of lining fabric that fit between the box spring and mattress. The problem with that method is that everything always shifts around. That’s when Mom started using the Velcro method." Check out Heather's other Tutorials!